Fig. (11) (a) WRF-UEMS Run B2 (WDM6 scheme) at 0900 UTC 26 December 2003 cross-section X1 in Fig. 1b. 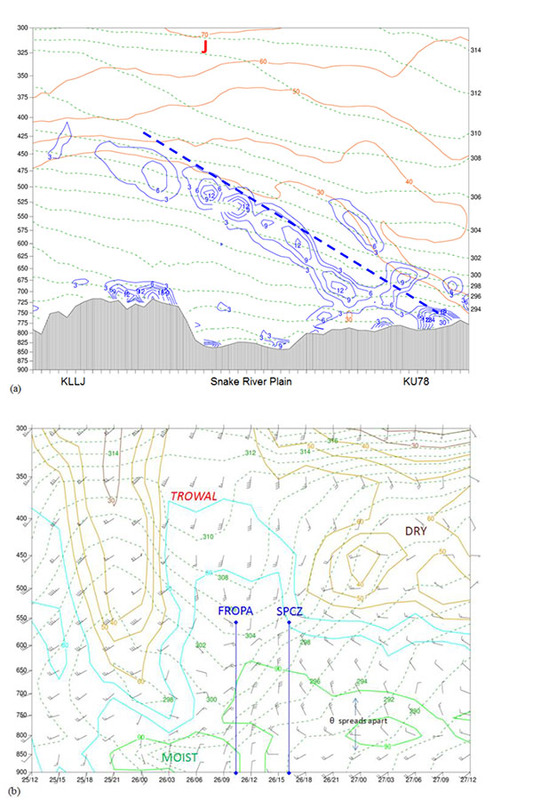 Frontogenesis function (solid blue contours with blue labels: K [100 km]-1 [3 hr]-1), potential temperature (dashed green contours with black labels: K), and wind speed (solid brown contours with brown labels: kt). The horizontal (transect distance: 450 km) and vertical (pressure: hPa) axes are displayed in the figure. (b) WRF-UEMS Run B3 (WDM6 scheme) meteogram at KPIH with relative humidity (solid color contours with color labels: %), potential temperature (dashed green contours with green labels: K), and wind barbs (black: kt). Each full wind barb is 5 m s-1 (10 kt) and flag is 25 m s-1 (50 kt). The annotations are described in the text. The horizontal (time: UTC date/hour) and vertical (pressure: hPa) axes are displayed in the figure. The model run cycle is 48-hours from 1200 UTC 25 December 2003 to 1200 UTC 27 December 2003.